Some friends of ours are going to be working on setting up a new craft room soon, and they were seeking input from their other crafty friends about what makes a good craft room. 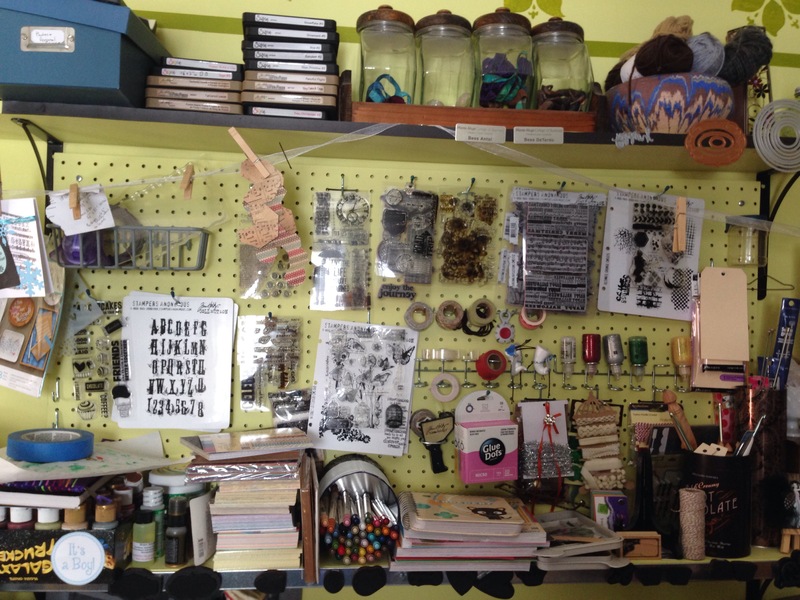 I realized that I hadn’t shared much about my craft space on my blog, and that I should share before it gets transformed. I’m planning to swap my craft space for my current nursery room, because I think my active toddler is soon going to need more space, and I need to resign myself to the fact that I am not doing enough crafting these days to justify having my own room in our little house. The move is my idea, so don’t feel sorry for me, I’m pushing myself into it. And I’m still planning to have craft space, it’s just going to get stuffed into the current ‘nursery’ room, which is about the size of a walk-in closet. And I’m going to make sure part of it is dedicated office space so my husband has a quiet place to study (some how I had a “my” space in our home, but he never had a “his” space). But if we do some finishing work to the adjoining walk-up attic, I might have even more storage space to fit all my craft supplies than I do now, even if they will be a bit less accessible. Here are some of my beloved peg-boards. I just love having so many tools and material accessible and inspiring. Small pegboard near adjustable architect’s drawing table. I am torn right now between moving the pegboards, or just re-purposing them for some kind of kid-friendly use and installing new pegboards in the new space. I think I may have done some gluing when I installed them, never imagining a need to remove them unless we moved out. See the magnetic (top) and metal (bottom) strips on each shelf? I came up with that clever idea to display/store my steel rule and Movers & Shapers dies. Large pegboard with upper and lower shelf sit above long narrow work table. I actually have to start thinking about clearing out and moving my own craft space, as I’m determined to give over that large room to our baby, his toys, and any possible future siblings. I think we’ll turn the small room+attic into an office/craft space. It will be good for my husband too, if he starts the PhD program, to have an office space where he can lock himself away when he needs to write. 3. I don’t have a good system for dealing with projects in process, and assimilating new acquisitions quickly. With very little time to walk into my craft room at all, I find that new things or stray non-current projects or tools from projects I just finished get dumped on my work surfaces just inside the door, and then when I need to whip something up really fast I have no where to do it. I don’t have a great solution for this, but one half-solution is that I have started having some “random stuff” containers on high shelves, so at least some things can go there out of the way. But I wish I had a real “stuff to sort” bin right inside my craft-room door. 4. I have cycled some materials into boxes and into the attic. There are simply some crafts I don’t need on-hand constantly anymore – e.g. I don’t make wreaths very often, so I don’t need all the florals in my craft room. I think in my new configuration I will have more easily-accessible space devoted to random catch-all, and shift more stuff like fabric into the attic since I don’t need to access it all the time. 5. If space were no object I would have picked up some flat map-drawers that were at an architect office sale years ago to store my large paper art (drawings and prints). We could have got them for a song, but at the time we were in a 1 bedroom apartment. Right now I don’t have a good place to store fancy scrapbook papers either, so I would get something to solve that problem. So if time and money were no object, I would get a bunch of cool very craft-specific storage items: A sewing station, some cool IKEA-compatible scrapbooking storage for stamp pads and paper, more sturdy clear stacking bins for all the miscellaneous fabric and stuff (Staples has a “Really Useful” line that I find very sturdy). But really, most of my problem these days is time, and keeping dangerous things out of toddler reach. 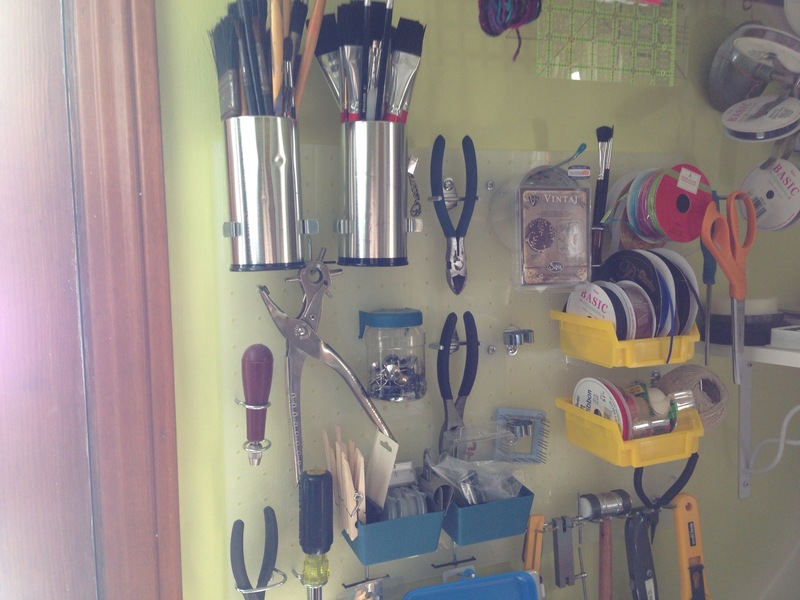 a) pegboard – so much you can do with pegboard, I want more of it, so great for all the crafty little knicknacks and tools, add cups, hooks, clips, it’s wonderful! 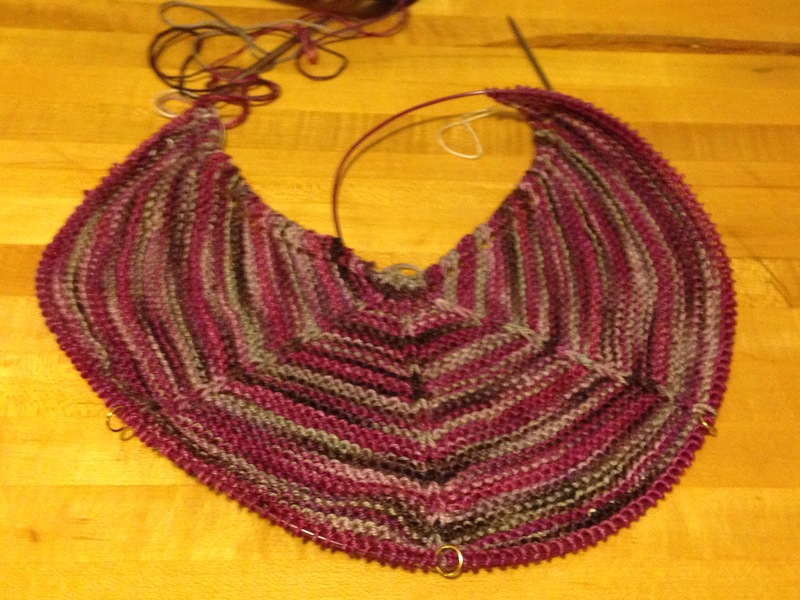 b) Having work surfaces far enough apart to run a ball-winder and swift (for knitting). Ask [friend’s spouse] to measure and make sure she can do it in the configuration. Not sure why the one review is so lousy, I found these to be incredibly hefty for sweater-organizers, I have two in my closet and they keep the dust and bugs away from my precious yarns, yet I still have a nice view of them. And it makes good use of a closet in a craft room. e) foam interlocking floor tiles (maybe you already have these?) 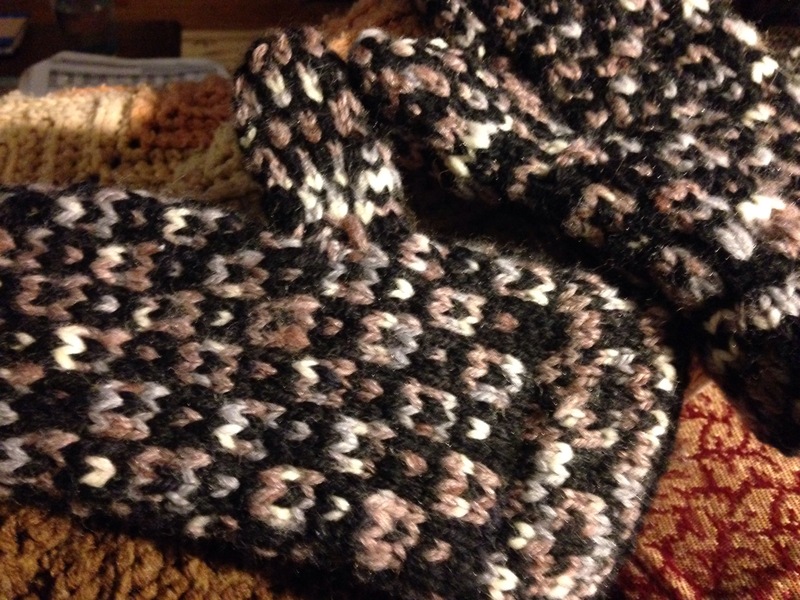 Great for blocking sweaters and all kinds of other uses, plus you can pin right into them. Although your cats will probably scratch them up as they have done to mine, but it doesn’t really inhibit their function too much. 1) leave enough room somewhere so that when [friend] creates her spinning wheel, you can rig a clever wall-hanger to put the spinning wheel out of kitty reach. 2) somewhere for a design board or pin-board? A lot of crafters like to have somewhere to pin inspiring things, or if quilting, a flannel design board to put fabrics and squares together and then step back. I have a little pin board, but I wish it were in a different spot, and might convert to a flannel board when I move everything. If you are thinking about craft-room design or organizing, I highly recommend finding issues of Studios by Cloth+Paper+Scissors at the library for inspiration. It focuses on studios of mixed media artists, so it’s pretty inspiring for people like me who like a lot of different categories of craft. Of course, some of the fine folks whose studios are featured have their own business space, or a large house, or an out-building in which to come up with the perfect studio. But some of the storage solutions are inspiring even in small houses such as ours. 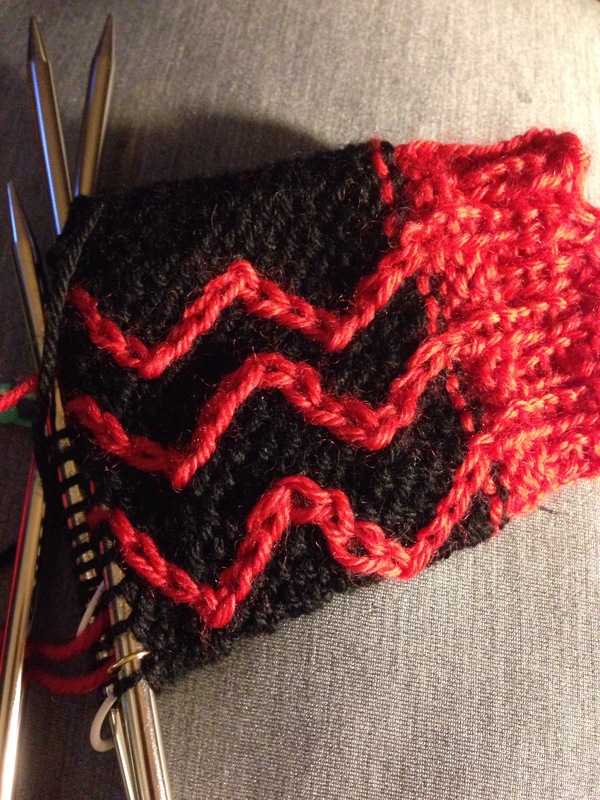 Finally, some quick updates on recent knitting projects.